The biggest stories in chronic pain research from 2018 have examined different chronic pain experiences between men and women, and between the rich and the poor. Research in 2018 looked into what lifelong practices are the best at preventing or minimizing pain. Scientists also delved into the new cutting-edge approaches to managing pain from psychological approaches to biological and neurological interventions. Here’s what they learned. A study conducted at the University of Birmingham and King’s College London found that staying active throughout your life keeps your body young. Researchers compared cyclists above the age of 55 to a group of adults who did not engage in regular physical activity. Not surprisingly the cyclists had more muscle mass and strength as well as healthy body fat and cholesterol levels. In addition to the common sense benefits of regular exercise the research also showed that exercise impacted the rate at which our immune system ages. The thymus, a vital organ in our immune response, was operating at the same level as a person half their age. The researchers hope their study will show people that aging doesn’t mean frailty and that by engaging in regular exercise throughout their life, people are able to enjoy being healthy and active far into old age. Robert J. McCarthy, Pharm.D professor of anesthesiology at Rush University Medical Center recently presented an innovative new treatment at the Anesthesiology 2018 annual meeting. McCarthy has been studying an alternative to opioid and spinal cord stimulation for patients suffering from chronic back pain. Dorsal root ganglion (DRG) stimulation therapy involves placing a pacemaker-like device that targets the specific source of pain. The device then sends small, low current electronic impulses through a wire connected to the nerve. New pain signals from the brain now have to pass through the DRG device. This replaces the pain signal with a more tolerable sensation such as tingling. Participants in the study reported pain levels of around 8 on a scale of 1 to 10 prior to DRG stimulation therapy. After the device was implanted the median pain score dropped to below 5. 27% of patients reported decreased limitations in daily living and 94% of participants found the treatment to be beneficial overall. Dr. McCarthy believes DRG stimulation therapy is a much needed non-drug therapy option for people suffering with chronic pain. Researchers at the University of Texas Dallas found evidence that there are potentially quantifiable differences in how men and women experience pain. They were studying the D5 dopamine receptors and bred mice that lacked those receptors. It was then that they noticed the male mice without D5 dopamine receptors did not respond as much to pain stimuli, while the female mice showed no change. The research team credits a 2014 order from the National Institutes of Health that requires preclinical experiments to include both male and female subjects. Up until 2014 many experiments opted for the simplicity of male only subjects and researchers are now discovering the data that went unknown by omitting female test subjects. These researchers are hopeful that this new data will help them better identify gender differences in pain origins so that they can better treat pain, possibly by developing gender specific treatments. A research team at Northwestern Medicine is working on a neuroimaging technique that may predict whether a chronic pain patient will respond to a sugar pill or placebo pill and which will not. Researchers conducted a randomized controlled trial where one of the groups of participants were given an active drug for pain relief and another group was given a placebo pill. Brain scans and questionnaires were administered six times over eight weeks. Fibromyalgia patients are ten times more likely to die by suicide than the general population. Researchers at Vanderbilt University have used machine learning to understand protective measures specific to fibromyalgia sufferers. Machine learning software analyzed electronic health records from more than two decades. It was able to identify factors for fibromyalgia patients at risk of having suicidal thoughts, including fatigue, dizziness, and weakness, alongside risk factors for suicide attempts which included obesity and substance use. It was also able to identify a protective factor. Fibromyalgia patients who spent more time annually engaging with their physician were significantly less likely to die by suicide. They hope this knowledge can help prevent more fibromyalgia patients from slipping through the cracks. Helping to ensure patients are routinely engaged in their care can have a drastic impact on the number of suicide deaths within the fibromyalgia community. The brain likely has at least two major pathways for processing and responding to pain: an opioid pathway and a non-opioid pathway. One pathway activates when opiates are introduced via neurotransmitters or pharmacologically. The non-opioid pathway, and when each pathway is activated, is a growing area of interest for pain researchers. One study published in the Journal of Neuroscience set out to determine which pathway was activated under two pain modulation exercises: mental imagery and relief expectation. To do this, they applied heat to participant’s arms. The mental imagery group was asked to reframe the pain and imagine it as a pleasant experience, such as warming up by a fire. The relief expectation group was provided with visual cues to manage their expectations about when the pain would stop. Researchers administered Naloxone, the fast acting drug used to treat opioid overdose, to both groups. They found that the relief expectation exercise activated the brains opioid pathways. Therefore, the Naloxone blocked the naturally-released opioids and any pain reduction. However, the Naloxone did not reduce the pain in the mental imagery group. This led researchers to conclude that this practice activates the non-opioid pathway. This knowledge opens doors for greater pain management by being able to combine opioid and non-opioid pain reduction methods. The sociology department at the University of Buffalo has published their findings about the prescription rate of opioids to poorer, older adults. According to the study’s author Hanna Grol-Prokopczyk, poor adults are nearly twice as likely to be prescribed opiates than their counterparts in different socioeconomic backgrounds. She also focused on the aging poor who are even more likely to rely on opioids. Study participants used their opioid prescriptions as prescribed. More than 75% of participants reported being satisfied with the level of pain relief they got. Understanding the patterns of use throughout different age and economic groups is valuable information. This is especially true as the opioid epidemic changes prescribing patterns. Hanna Grol-Prokopczyk points out that it can be very difficult or impossible for the aging poor to have access to alternative pain treatments. These may include therapies like physical therapy or cognitive behavioral therapy. Scientists in Sweden are gaining more understanding about a chronic mouth pain condition known as burning mouth syndrome (BMS). BMS is mainly seen in women, middle-aged and older. Patients report a burning or tingling sensation of the tongue, palate, lips, and/or gums. It is also associated with dry mouth and altered taste sensation. The newest findings show that patients with BMS also report higher incidents of skin disease and skin problems than the general population. They also found that BMS patient’s saliva has low amounts of carbohydrate structures which impact the mouth’s immune system. These findings will be incorporated into a larger body of research aiming to develop a diagnostic and treatment model for BMS. Researchers are Binghamton University in New York are learning more about how life stressors impact opioid use risk. Specifically, they looked at which life stressors in particular put an individual at the most risk. Their findings suggest that low self-esteem negatively impacts an individual’s ability to cope with negative life stressors. It is this lack self esteem that researchers believe creates increased risk for opioid use. They believe there is a biological component. Stress and social problems lead to low self-esteem and depression, which indicates reduced serotonin and dopamine levels in their brains. Opioids rapidly increase serotonin and dopamine serving as a self-medication to low self-esteem and life stressors. Researchers hope to increase awareness of the complicated relationship between low self-esteem, life stressors, and opioid use risk. They suggest seeking programs and services that specifically help individuals learn how to cope with life stressors and low self-esteem. Additionally, they encourage professionals working with those using opioids to be mindful of the risk factors that may make their clients particularly vulnerable. Clinical psychology researchers at Syracuse University just published the first meta-analytic review of the effects of cannabis on pain. Due to the complicated legal history of cannabis, researchers have faced significant challenges to study its therapeutic effects. The research team is excited to start learning more about the analgesic properties of cannabinoids and gaining greater understanding of the pain-relieving properties of cannabinoids. People who are depressed are more likely to be prescribed opioids. People who are prescribed opioids are more likely to be depressed. There is a bidirectional relationship between the two. The research suggests that physicians need to screen for depression when prescribing opioids and have a conversation with their patients about the risk of addiction. Researchers at the University of Nevada, Las Vegas have found that pain from time spent hunched over an iPad might have more to do with your gender and posture than the amount of time you spend playing Candy Crush. Physical therapy professor Szu-Ping Lee said the younger population is significantly more likely to experience neck and shoulder pain symptoms. He also found that women are 2.059 times more likely to experience musculoskeletal symptoms than men. If you’re suffering from pain, there is help. Highly-qualified pain specialists across the U.S. apply the most cutting-edge chronic pain research into their current treatment plans. 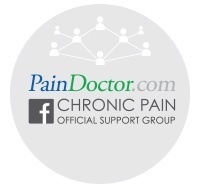 These doctors also make your current lifestyle and needs a priority in treatment.You can find a pain doctor in your area by clicking the button below or looking for one in your area by using the tips here: https://paindoctor.com/pain-management-doctors/.